Climate Change Checkup, 8/20/17: Will Global Warming Let There Be Light? The August 21, 2017 eclipse of the sun will be total in parts of 14 states. Graphic courtesy of NASA. Around the globe, 2017 continues to be the second warmest year on record through July, and a movie highlights the politics of global warming. But today’s big news is about a don’t-blink-or-you’ll-miss-it midday darkening of the sky along a path where 14 million Americans live and many more will be visiting. You wouldn’t think the climate would have any effect on the motions of stars, planets, and moons — and it doesn’t. But it might affect the viewing of the total solar eclipse that will occur in a narrow path across North America on August 21, 2017. The law of gravitation is relatively simple: Bodies pull on each other in a predictable way and their motions can be determined to great accuracy. Occasionally three bodies come into syzygy — they line up — and the results can be rather spectacular when viewed from one of the bodies involved. When the earth comes between the sun and the moon, viewed from the earth the moon goes dark since the only light it emits is reflected sunlight; when the moon comes between the earth and the sun, the sun goes dark. An eclipse of the sun is rare and spectacular — a minute or two (that’s all the time it lasts) of night in the middle of the day. The August 21, 2017 eclipse will be seen from the coast of Oregon to the coast of South Carolina, and the path of totality will pass through a total of 14 states. Millions of people will travel hundreds of millions of miles to see this rare celestial event — but they will only see it in all its glory if the weather permits. Even on a rainy day, a sudden minute of nighttime is exciting; but most viewers want to see the moon cover the sun in a cloudless sky. That’s where global warming comes in. Air can accommodate water molecules in the gaseous state; these gaseous water molecules are called water vapor. There is a direct relationship between the temperature and the amount of water vapor the atmosphere can hold. As the climate warms, we can expect it to hold more water vapor. More water vapor could mean more clouds. Studies show that cloud patterns are shifting, but whether there is an overall increase in cloudiness is still an open question. In any event, random wiggles in the jet stream cause local conditions to vary enough on a daily basis to overwhelm the effect of long-term changes. If you can’t make the trip to Oregon or South Carolina and miss this eclipse, don’t despair — there will be another in North America in less than seven years. On April 8, 2024, a solar eclipse will cut a path of totality from Mexico to Maine. Who Will Have Clear Skies For Viewing The Eclipse? The forecat for the day of the eclipse shows the best viewing to be in the western part of the path of totality. Forecast courtesy of NOAA. Climatologically speaking, the best place to view the eclipse will be the inland west. The latest forecast shows clear skies in Oregon, Idaho, and Wyoming. East of there, the best chance for a clear view will be in Tennessee. Elsewhere clouds may obscure the sun, especially in Kansas, Missouri, and coastal South Carolina. July set warm temperature records in many parts of the world. Graphic courtesy of NOAA. On August 17, NOAA released its report on July’s global land and sea temperatures. Globally, 2017 was the warmest ever over land, third warmest over the ocean, and second warmest overall, trailing only the El Niño-fueled year of 2016. New record high July temperatures were established in much of southern Africa and adjacent waters of the subtropical South Indian Ocean, many parts of China, most of the Arabian Peninsula, and a good part of Australia. No cold temperature records were set, but it was below average in most of Russia, the northern Atlantic Ocean, and the northwest Pacific Ocean. The latter two cold spots have been dubbed anti-blobs by Decoded Science, and we have hypothesized that they are fueled by glacial runoff. 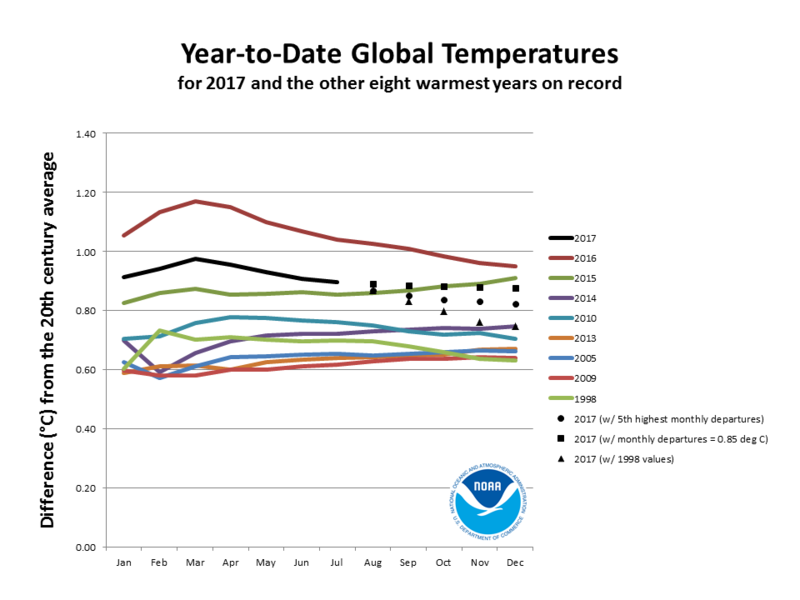 2017 year-to-date is second warmest overall and second in all nine NOAA-measured categories. Graphic courtesy of NOAA. Longer-term averaging gives a better picture of overall trends than monthly data. The period January through July of this year ranks second to 2016 in all nine categories that NOAA compiles: by hemisphere and by land and sea. Most projections show 2017 finishing third behind 2016 and 2015 in global temperature. Judged by the difference between 1999 and 2017, two years that followed powerful El Niños, the world is warming at a rate of about 1 C per 50 years, a rate considered unacceptable by nearly all climate scientists. The Paris Agreement is not in the news; 2017 will likely not surpass 2016 as warmest year in record-keeping history. Parts of the movie are self-serving; much of the evidence for global warming is anecdotal rather than scientific. However, the film makes certain political principles clear. Pressed on India’s plans to construct hundreds of coal-fired power plants because of their lower cost than renewables, India’s Minister of State for Power, Piyush Goel, points out that the developed nations have been burning fossil fuels for 150 years, while India currently has 300 million people without electricity. He argues that when Indians have a national average income equivalent to that of developed nations, they can reasonably be expected to curtail burning fossil fuels. The final agreement reached in Paris requires developed nations to give financial and technical assistance to developing nations so they can afford to skip fossil energy and go straight to renewables. Decoded Science views these payments as a retroactive carbon tax. Decoded Science also views the agreement as fair to all parties. It will be a while before we find out if the agreement works in practice — and if the effort to restrict the emission of greenhouse gases will be sufficient to avoid catastrophic changes in Earth’s atmospheric circulation. Hm. Your paragraph on coal burning in India explains a comment I received on an article about burning dung I wrote. The commenter wished information on comparing the two fuels. It was merely an intellectual question to me, but I see from your article there was underlying meaning to the query.